Pfister, a long term and trusted name in kitchens, laundry and lavatory plumbing accessories. 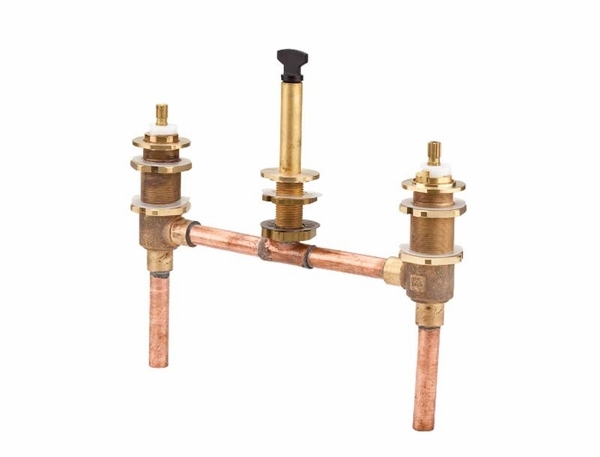 The Pfister Pfirst Roman Tub Rough-In Valves comes with the Pforever Seal. This is an advanced ceramic disc valve that uses the newest technological advances to create a seal that will never leak. It does not matter if you are purchasing Pfister accessories for the their aesthetic or back end valves, for their durability and function, Pfister provides their exclusive Pfister Pforever Lifetime Warranty on all of their products. Enjoy a relaxing roman bathtub with the peace of mind a solid foundation brings to your home.